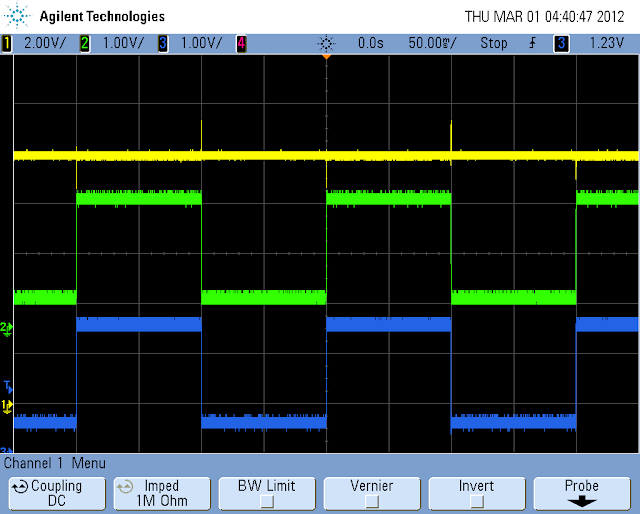 In this post we will look at how to build a low cost DC electronic load (eload) using general purpose test equipment found on every engineer's test bench and some simple circuit components. The eload we build can be used for testing and validating power supplies and other power sources. The below figure shows the eload circuit. The only piece missing from the figure is the measurement instrument(s) which are used to measure the voltage across the eload and the current through the eload. To measure voltage or current a scope, DMM, or digitizer could be used. The measurement points for the voltage and current measurements are mark in the figure as "Vmeas" and "Imeas" respectively. The device under test (DUT) is the DC power source we are testing with our eload circuit. The N-Type MOSFET serves as a variable resistor and is the main component making up the load that the DUT is connected to. Its resistance is dynamically controlled by the op amp. The MOSFET will be dissipating the majority of the DUT's output power so power handling is a critical spec when choosing a MOSFET. You also want to ensure the MOSFET has proper heat sinking. R1 serves as a sense resistor. The voltage drop across R1 is used by the op amp to control the current output of the DUT. R1 is also used to measure the output current from the DUT. The op amp dynamically controls the resistance of the eload. It works by taking a control voltage level into its non-inverting input. It will then drive the gate of the MOSFET so that the same voltage value is at its inverting input, which is connected to the R1 node. This means the op amp allows us to control the voltage drop across R1 regardless if there is a change in the DUT's output. Since we know the value of R1 we can control the amount of current through R1. Since R1 is in series with the load, this means we can control the output current of the DUT. The function / arbitrary waveform generator (FG / AWG) provides the control voltage to the op amp, which means it determines the output current of the DUT. The FG / AWG can be used as a simple DC bias to create a static output power from the DUT or a waveform could be used to create a dynamic load change (we look at an example of this later). A basic bench top power supply can be used to power the op amp. You can use a bipolar supply to provide both the positive and negative supply voltages for the op amp. To measure the voltage across the eload or the current through it a scope, DMM, or digitizer can be used. To measure both simultaneously you will need two channels. The voltage is measured from the drain of the MOSFET to ground. The current is measured by measuring the voltage drop across R1 and using the value of R1 and Ohm's Law to calculate current. The DMM is only good for static measurements. The scope or digitizer should be used when trying to capture dynamic voltage and current measurements. NE5534A op amp. Chosen for high output bandwidth and low noise output. IRFP150N power MOSFET. Chosen for its high power handling and low "on" resistance. Used with a metal heat sink. To create a sharp repeating load transient that ranged from 0.5 A to 2.5 A, the 33521A was setup to output a pulse signal that ranged from 0.5 V (0.5 V * 1 Ohm = 0.5 A) to 2.5 V (2.5 V * 1 Ohm = 2.5 A). Below is a screen capture from the scope showing the voltage across the eload (yellow) which is the power supply's output voltage and the voltage drop across the eload's sense resistor (green) which is the power supply's output current since the sense resistor is 1 Ohm. The blue trace is the pulsed output of the 33521A FG / AWG. Notice from the green trace the load toggles between drawing 0.5 A and 2.5 A. This is equivalent to the eload toggling between 20 Ohms and 4 Ohms. Notice the positive and negative spikes on the yellow voltage trace, they are power supply transients caused by the sharp load changes, this is what we want to measure. In the below figure, using the scope cursors, the power supply's transient response time was measured to within 3% of 10 V.
As you can see in the above figure the transient response time of the supply was < 1.4 us. We can also see the max deviation of the supply's voltage level due to the sudden load change, which is about 1.25 V or 12.5% of the nominal voltage level. One thing you have to watch out for when building the eload circuit is oscillations. To prevent oscillations be sure to keep all wiring, connections, and traces as short as possible. Use a large ground plane and be careful to avoid ground loops. You can also add coupling capacitors as needed. 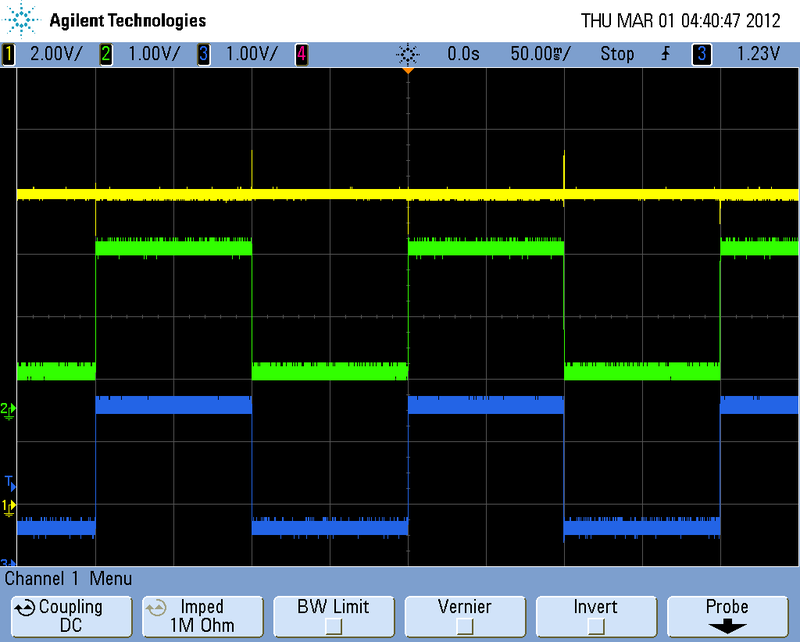 In this post we looked at how to build a simple bench top DC electronic load for testing power supplies and other DC power sources. The eload design employs some general purpose test equipment and basic circuit components. The best part about the eload design that was presented in this post is it is essentially free since it uses common benchtop instruments and basic components that can be found in lab stock. If you have any questions on this post email me. If you have any comments or personal insights to add use the "Comments" section below.